If you've ever seen a Korean drama, you've probably heard of City Hunter. It's one of the most iconic Korean dramas and one of my personal favorites. It's the story of a young man named Yoon-Sung raised for revenge, and it follows him as he becomes the upright, black-hat-wearing, alter-ego-performing vigilante known as the City Hunter. When I first saw the drama, soon after it aired, I initially thought Lee Min-Ho would be my favorite thing about it. Not only is he one of Korea's handsomest, most talented young actors - every role he chooses is a delight. Imagine my surprise when he was not my favorite part of the drama. Anyone who knows me knows I have a penchant for falling in love - usually with minor characters. Usually with sketchy minor characters. Usually with sketchy minor characters who die. And I don't choose them on purpose - they just jump out of dark alleys and force me to notice them. Such was the case with Man Doo-Shik (Sung Chang-Hoon), the ex-boxer who now serves as a villain's henchman. It takes a few episodes for him to show up, but once he does, he is a steadily recurring character until the end. I love Doo-Shik. In fact, I love Doo-Shik so much that I get in the mood to watch City Hunter just for him. I can take or leave the rest. Why do I love him so much? I'll tell you. I've only ever seen Sung Chang-Hoon in two roles - his role as Doo-Shik in City Hunter and his role as Ppoolte in Mask. (I never call him Doo-Shik anymore, like I am for the sake of this article. I just call him Ppoolte no matter the context, for several reasons - one, it's a hilarious name meaning 'Horn-Rimmed' and I have no idea what happened to make people give him that name. 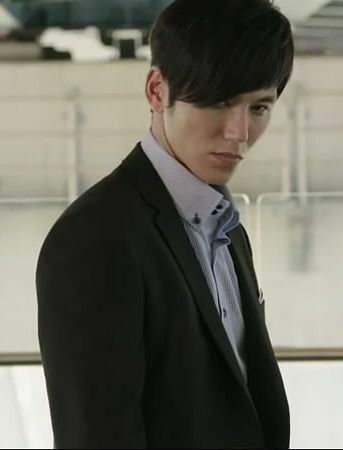 Two, he's basically the same character in Mask that he is in City Hunter - just a little older and possibly more mature.) Chang-Hoon is one of those people who is not 'handsome' in any classical sense but who possesses a certain magnetism that makes him difficult to look away from. If he's in a scene, he's the one you're watching - not the main character. Doo-Shik might be a minion, but he's a strangely likable one. Granted, he runs around attempting to kill the hero, and he occasionally resorts to base means; but he's not wholly bad, especially compared to other kdrama minions. He carries out his orders to the best of his ability, but is never 'out for himself.' He bows at his enemies in public hallways. He doesn't endanger innocent bystanders - unlike, say, Vick from IRIS. He's not a terrorist - he's just a guy trying to do his job, and the constant thwarts are getting on his nerves. He's also the only real opponent Yoon-Sung ever has in a fight. When everyone else turns and runs, terrified of getting beat up by Yoon-Sung, Doo-Shik steps in and takes him on, without backing down. In fact, he never backs down - he keeps coming, unafraid, until he is literally unable. It's not often a minion serves as a worthy opponent for the hero, but Doo-Shik does and is. He is also, at times, strangely unpredictable - and unnecessarily nice. (At least as nice as a frowning thug can get.) In one scene (the scene where I first fell in love with Doo-Shik), the villain becomes irritated at a little boy in a hospital hallway. 'Get rid of him,' he orders. Now, coming from this man, 'get rid of him' could very easily mean 'shoot the kid and stuff him in a broom closet.' Especially when that kid is the son of a woman causing the villain problems. Instead, Doo-Shik takes money from his own pocket and gives it to the boy, effectively 'getting rid of him' without violence. In another scene, Doo-Shik is ordered to force the kid's mother to place her thumbprint on a document - and again, Doo-Shik does not resort to violence. He uses his strength against the weaker individual and forces her to place her mark on the document - a move interesting for two reasons. One: The woman's small son was right outside, and Doo-Shik knew it - but chose not to take advantage of the fact. Two: He could have injured the woman or physically harmed her to make her sign - but Doo-Shik is not a vindictive man, unlike many of the slimier minions in Kdramaland. He goes in, does the job, and leaves without unnecessary fuss. 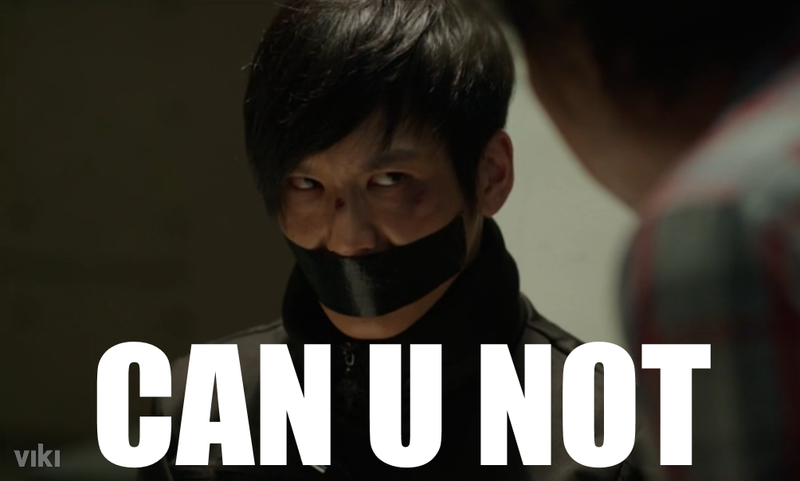 His plan, of course - although nearly successful - is an ultimate failure, and Doo-Shik is captured by Yoon-Sung. (The scenes illustrating his captivity are some of my favorite in drama history - because it's not often my favorite character is tied to a chair and forced to listen to self-help books.) Still, he remains loyal to his boss - until Yoon-Sung makes a phone call and Doo-Shik overhears his boss openly throw him under the bus. It's also a moment of brilliant acting for Chang-Hoon, who manages to portray a deep hurt and betrayal using only his eyes. I even made him into a meme. I use it with some regularity. Overall, Doo-Shik is my favorite character in City Hunter because he's the most interesting and charismatic. Is it a small role? Comparatively, yes. Is he a good guy? Not by a long shot. But we get to know him, to an extent, over the course of the drama - and we see a quiet professional who walks the line between comedic relief (his consistent irritation at the world is honestly pretty funny) and intense antagonist. Also, just a heads-up: if Sung Chang-Hoon is ever cast in anything but a minor role, you will hear my ecstatic screaming across the globe. He deserves it. Who is your favorite drama minion?